During a ball at the Duke of Mantova’s, the latter confesses to his friend Borsa his desire to seduce a young girl he has seen in church. But his attention goes to all women, including the spouse of Count Ceprano. Rigoletto, the Duke’s court jester, overtly encourages him to get rid of the unwanted husband, which makes Ceprano furious. As for Marullo, he announces to everyone an astonishing discovery, namely that Rigoletto would have a mistress. Ceprano sticks to his revenge: that very same night he will abduct the mistress in question. The ball is cut short by Count Monterone, who accuses the Duke of having dishonoured his daughter. 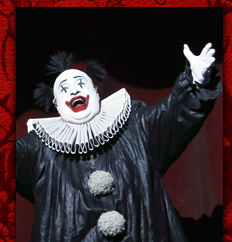 Rigoletto’s persistent mockeries lead Monterone to curse him. Tormented by the curse, the jester goes back home. On his way, he meets Sparafucile, a hitman who offers him his services. Left to himself, Rigoletto compares both professions: the hitman uses his sword where the jester uses his word. He then meets up with his daughter Gilda, whom he forbids to leave the house except to go to church. Gilda questions him in vain on his past and her mother’s death. Rigoletto, as he believes he hears some noise, goes out in the street. It is the Duke, who has come to spy on the mysterious unknown young woman and who now understands that she is his jester’s daughter. Rigoletto comes back to take leave of his daughter. Gilda then confesses to her governess Giovanna that she has met a very seductive young man in church. The Duke appears, declares his love, passing himself off as a student named Gualtier Maldè, and then leaves. Gilda dreams of her beloved, whereas as Ceprano, Borsa and the other courtiers are watching her, believing she is Rigoletto’s mistress. The latter chances upon them, as he retraces his steps. They claim they pretend they want to abduct Ceprano’s wife. Rigoletto accepts to wear a mask and takes part in the abduction only to enable the courtiers to flee with Gilda. The jester understands too late that he has been tricked and believes it to be the effect of Monterone’s curse. The Duke is lamenting that the young woman he coveted has been abducted. The courtiers reassure him however: they are the ones who abducted Rigoletto’s mistress. Consumed by desire, the Duke goes to meet with Gilda. Feigning indifference when he is actually in despair, Rigoletto starts to search for his daughter. As he understands she is with the Duke, he discloses she is his daughter and begs the courtiers to give her back. Gilda then appears and throws herself in her father’s arms. Once alone with Rigoletto, she confesses she is in love with the Duke. A court usher interrupts the confidences, announcing that Monterone is arrested and will be jailed. Rigoletto offers him his vengeance. This entry was posted in OPera and tagged Bolshoi, Moscow, Rigoletto. Bookmark the permalink.